The image is hand drawn in pen and ink using a 2 point perspective then digitally rendered. Absolutely brilliant! 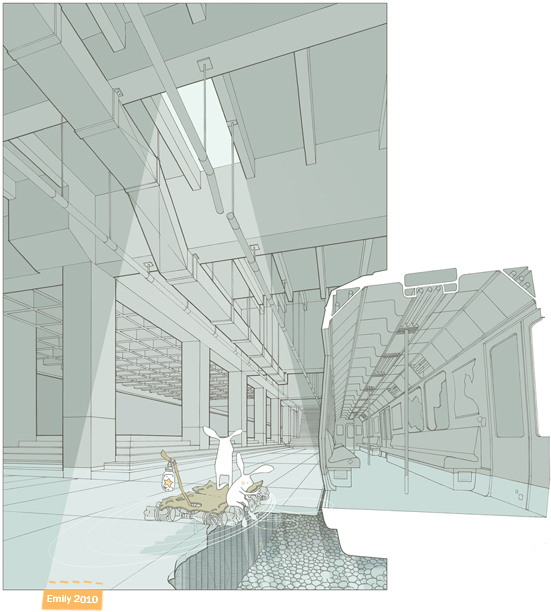 Love the combination of the technical/architectural drawing with the bunnies!! Wow Emily! You're so clever! Love this Emily! Love all your work! So inspiring! Wow, this is amazing. Great stuff. I like the way you've depicted the light from the ceiling hole, simple and effective! I am happy to see you're back. I love the light architectural feel, and the muted colors. I want to visit this bunny world, and ride on their ingeniously crafted 2 liter raft with them! This is really cool...awesome perpective. very nice work, keep it up! What brilliance to see whimsy/fun with architectural. It makes my eyes dance. Ooooooooooohhhhh, a soda bottle raft! Emily, this is AMAZING! Fantastic Emily! Great depth. Always fun to catch up on your beautiful work. the combination of the technically perfect architectural perspective and your beautiful bunnies is awesome!!!! I'm so glad you are back drawing and posting! Great and original stuff you´ve got gathered here. Its been a blast looking through your blogg. I could never get tired of your illustrations! love these - they are awesome. Nice work! Now that's patience! Beautiful job on this. Your illustration is a great example of accurate perspective applied to a dynamic environment and your attention to detail and staging is fantastic. Well done!